Info Ed Royce (R) is serving his sixth term in Congress representing California's 40th District. Since his election to the U. S. House of Representatives in 1992, Royce has earned a reputation for his tough, no-nonsense approach to governing. He has worked consistently to provide meaningful tax relief for hard working Americans and streamline burdensome regulations. Republican Whip Tom DeLay appointed Royce an Assistant Whip for the 107th Congress. The Whip organization is the formal structure in the House to organize and "grow-the-vote" for Republican initiatives like tax relief for working Americans, strong education standards, bolstering our national defense, strengthening Social Security, and continuing to pay off the federal debt. Royce has consistently earned the "Taxpayers' Hero" award from the Citizens Against Government Waste, the "Taxpayers' Friend" award from the National Taxpayers Union, and the "Golden Bulldog" award from the Watchdogs of the Treasury. Royce is a member of two important committees in the House. He serves as a ranking member on the International Relations Committee where he is chairman of the Subcommittee on Africa, and a member of the Subcommittee on East Asia and the Pacific. Royce also serves on the House Financial Services Committee. Within this committee he serves on three subcommittees: Subcommittees on Capital Markets, Insurance and Government Sponsored Enterprises; Domestic Monetary Policy, Technology and Economic Growth; and Financial Institutions and Consumer Credit. As a senior member of this committee, he has served on two historic conference committees that drafted the final legislation ultimately signed into law. Royce was a conferee for the landmark financial services modernization bill, which repealed the Glass-Steagall act, and completely modernized our nation's financial services sector. More recently, Royce served as a conferee, and was a co-author of the corporate accountability legislation that toughened penalties for corporate criminals, provided greater oversight for the accounting profession, and increased the volume of information disclosed to investors. As a California state senator Royce began his fight for victims' rights, during which time he authored the nation's first "anti-stalker" law. Versions of his bill have been adopted in all 50 states. He was also the legislative author and campaign co-chairman of California's Proposition 115, the Crime Victims/ Speedy Trial Initiative, approved by the voters in 1990. 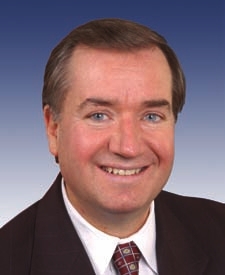 In Congress, Royce continues his work for victims' rights. He wrote and passed the Interstate Stalking Punishment and Prevention Act, signed into law in 1996, making it a federal crime to pursue a victim across state lines, and enabling law enforcement to intervene before violence occurs. He is also a co-sponsor of a constitutional amendment to guarantee the rights of victims under our legal system. Criminals are guaranteed over two-dozen rights under the U.S. Constitution - fifteen of which were provided through amendments to the U.S. Constitution - while crime victims do not have enumerated rights. A California native, Royce is a graduate of California State University, Fullerton, School of Business Administration. His professional background includes experience as a small business owner, a controller and capital projects manager. Royce served as corporate tax manager for a Southern California company prior to entering public service as a state senator in 1982. Ed and his wife Marie are longtime residents of Fullerton, CA. CA District 26 - Open Primary - Jun 05, 2018 R Antonio Sabato Jr.